Now this is by far my favourite possession. Like many people who had not looked through an APO scope before I had always thought that they were a complete waste of money for all but the most exacting of observers! Was I wrong! I had an opportunity to look through an 80mm APO scope a while back and it blew me away. I sold my previous gear and purchased the Megrez. The contrast and detail is absolutely amazing. Stars a pinpoint jewels on a jet black background. The lunar views are beyond comparison. It can also be driven to crazy magnifications before the detail breaks down. The Megrez is magnificently engineered with an incredibly smooth 1:10 speed Crayford focusser. It has an aperture of 90mm (3.5”), a focal length of 621mm and a focal ratio of f6.9. The apochromatic lens is a doublet constructed of FPL53 flourite glass to eliminate the false colour so prominent in short focal length achromats. 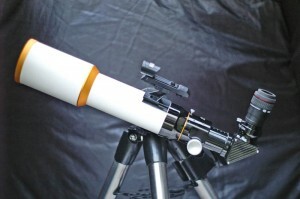 Using 2” eyepieces it is possible to obtain stunning widefield views of the night sky. 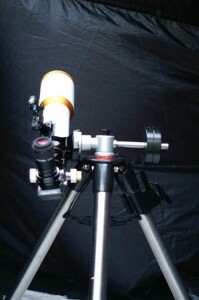 While it can’t match the optics or finish of a Takahashi, TeleVue, Astrophysics, et al, it’s more than enough for my needs. For planetary and lunar viewing it is possible to get stunning views using the 2.5x Powermate and 5mm Hyperion. That’s equivalent to a 2mm eyepiece! Add to this it’s superb portability, quick cool down time, very functional retractable dew shield, and an excellent price point compared to most other APOs in this range this scope is a winner. Downsides? Well, it’s only 3.5″. Unfortunately, it would cost an arm and a leg to get a refractor along the same aperture scales as a typical newt, not to mention the beefy mount required and less portability. Here it is on the Giro Mini.